Red Market Last Week, Is Your Investment Affected? It’s Sunday, and no trading day, a day that was agreed by many in the Philippines as the day of worship and is the time to contemplate with our Lord. Remember that we are just a steward of his blessing and whatever the Philippines is experiencing about its great economy is God’s plan for Filipinos. 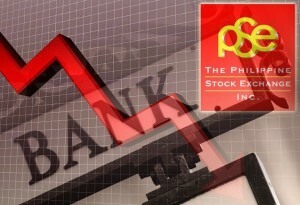 Last week Philippine stock market have experienced a “Red” mark. (Just for information “Green” means gain and “Red” means lost). According to the news , it was due to the weak banking sector that makes the market “Red” last week. Many have taken their profit due to non-availability of good news as cited in the news. Remember that I have told you that news could affect the price of the stock. So what was your strategy last week? Many might ask, is this the start of the so called “bear market“? Do I have to sell my MBT? BDO? or other stocks? As always it is still the decision of the stocks holders. Nobody is responsible for your stock but the owner. Let me also remind all of our readers that stock market is the riskiest investment in the market but also an investment instrument that could give the highest gain. More risk means more possibility of gain. Below is my take in those question. 50% of my portfolio is in banking sector so, my portfolio was affected. But did I sell last week? My answer is “NO”. I believe it is just a correction in the market. But this also reminds me of “diversification”. My portfolio should be diversified so that when 1 sector like banking is affected, my whole portfolio will not be affected. I also believe in Long Term Investment that is why I am not affected with the ups and down of the market. It’s all about mind setting. If I had more funds, I would be buying more since I believe that the majority of the blue chips stocks are now on sale. This is a very good opportunity to buy since an investor could buy more stocks with the same amount that he could be spending about 2 weeks ago. We will see if the market will still have its correction tomorrow. To those OFW who have not yet started investing, you need to think again and always remember that we need to be prepared for our family future. But first of all you need to have Emergency Fund before investing and control your expenditures buy knowing about Good Debt and Bad Debt. Increase your financial literacy. God provides, and this is 100% true and God will give His provision to those who have vision. The prudent see danger and take refuge, but the simple keep going and pay the penalty. Actually, I think all sectors were affected. But I do agree, long-term investors should be very happy. P/E ratio and valuations aside, the tag prices were getting very high, making it difficult to accumulate blue chips. At least now we can afford more shares for the same price.